Being asked to write a dental reference letter is both an honor as well as being a chore. A potential student for dental school is required to gain between 2 to 4 references to support their application. If they want to be able to succeed with their application against often very stiff competition then these letters of recommendation for dental assistant have to be very well written in a way that truly recommends the student to the dental school. Each dental school has specific requirements as to how many references they require and as to who the referees should be. For many schools the requirements are for two recommending professors and one from a dentist whom the potential student has shadowed or conversed at length with. But what is it that the selections committee is looking for with the dental reference letter? What Does a Dental Reference Letter Need to Cover? There is no professional reference letter template that will specifically cover a dentist assistant reference letter. The most important factor is the content rather than following a specific format or style. Does the candidate have a mature attitude? Can they handle stress well? Do they demonstrate self confidence? Are they a good hard working student? Do they have a sincere interest in dentistry? Have they investigated the career in depth? Are they capable of working well with others? Do they have compassion and empathy when dealing with others? The writer should be able to demonstrate these points as well as being able to also show through reference to grades, personal history or other relevant factors that they know the student in question. It is suggested that students supply their referees with a sheet covering their family history, grades, qualifications, interests and other relevant information to make the task simpler for the referee. If you have been asked to write a letter of recommendation for dental assistant and are not sure how to approach the task or are snowed under with other work, we are available to help. We understand exactly what needs to be written within a dentist reference letter and can work through our system to understand what you would like to write. Using your personal views we can then write a concise and well written reference letter for dental school that will reflect well on both yourself and the student whom you are recommending. 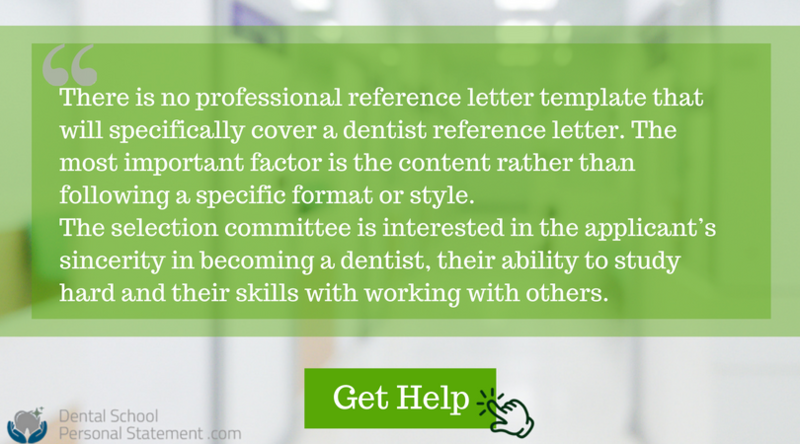 Get our help with writing the best dental reference letter for your application process!